Explore the Broughton Archipelago with the comfort and style of a mothership. Is your preferred date sold out? spaces are still available to explore the broughtons on our expedition trips. 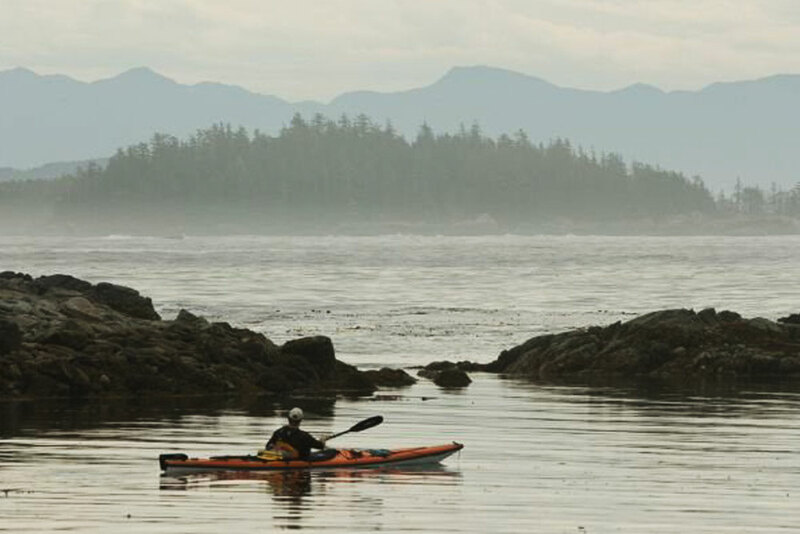 Set in the home of British Columbia resident orca population, this trip provides the ideal combination of pristine coastal wilderness kayaking and spectacular wildlife viewing. With the Columbia III onboard accommodation, we can easily travel to the untouched corners of the Broughton Archipelago (usually inaccessible by expedition kayakers) and position ourselves in the right place at the right time for the most unforgettable wildlife encounters. 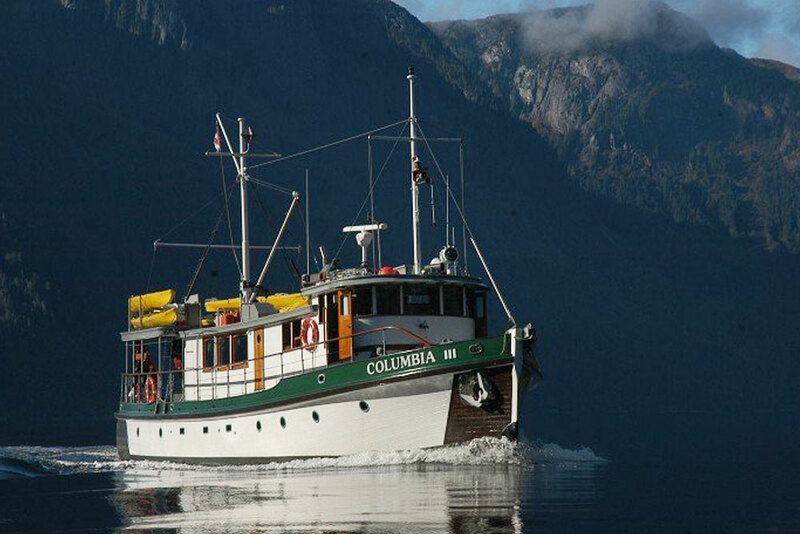 We spend our first night on the Columbia III at the historic coastal village of Alert Bay. Here we get a chance to view the famous graveyard totems and visit the renowned U’Mista Cultural Center – which, for many guests, sets the tone for what we are about to experience as we venture into the wild beauty of the Broughton Archipelago. Each day thereafter we continue our journey through the maze of islands steeped in First Nations history and back-dropped by the snow capped peaks of the Coast Mountains. Scheduling our day around a sea kayak paddle, usually beginning shortly after breakfast, we silently glide through the glacier-fed waters keeping a watchful eye for both marine and terrestrial life. Often the majestic bald eagle soars overhead while curious harbour seals swim close to check us out. 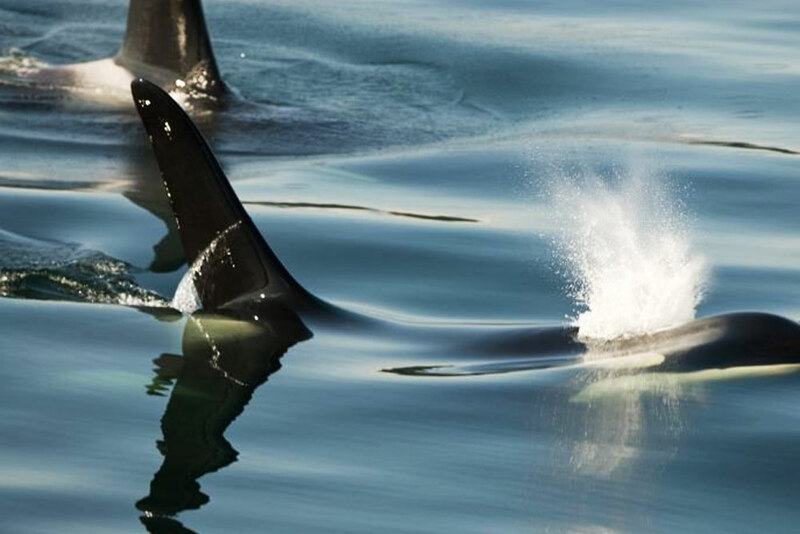 If we are lucky we may spot a black bear foraging on the beach or a group of pacific white-sided dolphins playing in the waves. 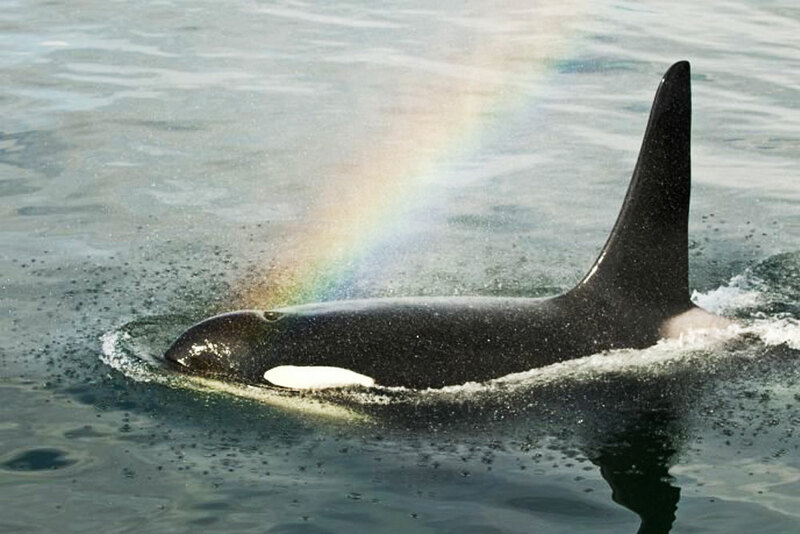 And of course we are always on the lookout for the mighty orca. We do our best to find them and we are rarely stumped. A stop for lunch in an interesting spot, such as an abandoned First Nations village site or a grassy islet, precedes the afternoon paddle, after which we rejoin the mothership, Columbia III. Back on board we refresh ourselves with a hot shower and get comfortable for an evening of gourmet food, laughter and relaxation. In this manner we move through this beautiful strait and archipelago creating each day around the needs and desires of our guests and anchoring each night in a new cozy cove each with its own stunning view. 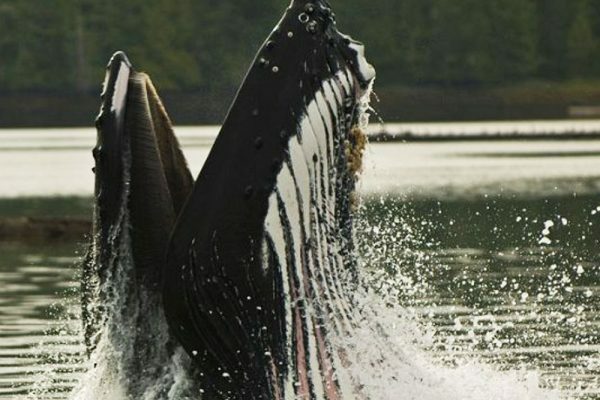 Walking in the rainforest, whale watching, visiting the local whale research station and simply relaxing on the deck of the Columbia III are all possibilities on this trip. And if the conditions are right, a night paddle may be an option where the truly magical phenomenon of bioluminescence can be experienced first hand. After an event-filled week, the Columbia III returns to Port McNeill early Saturday afternoon. The Mothership Adventure in Johnstone Strait and the Broughton Archipelago starts and ends in Port McNeill. 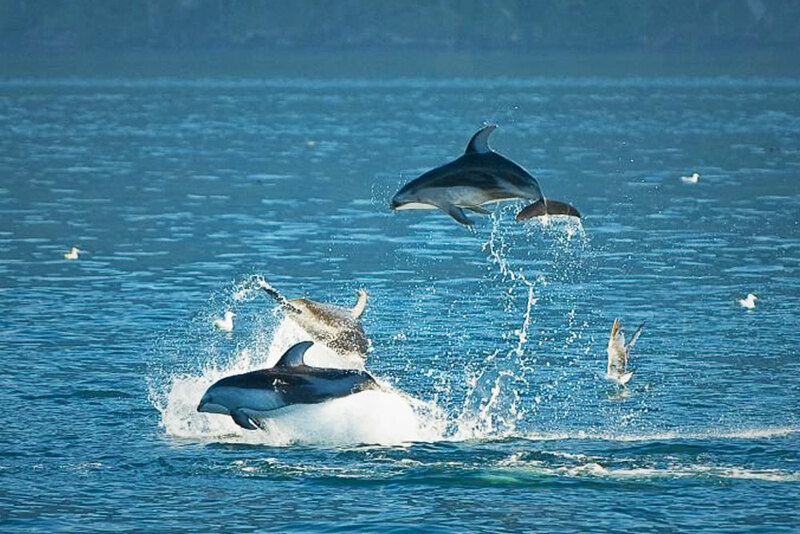 This journey takes us through a variety of fascinating and stunning locations among the beautiful islands and Killer Whale waters of Johnstone Strait. The Columbia III will be awaiting your arrival in the sea-side town of Port McNeill. Here you will be greeted with a warm welcome from the Columbia’s captain and crew as we prepare to cast off. Departure time aboard the Columbia III is 6 pm. The first night we will moor at the First Nations’ village of Alert Bay, home to the renowned U’Mista Cultural Center. At 9am sharp we will visit the U’Mista Cultural Center giving us an appreciation for the culture and history of the local Native people. Back onboard the Columbia III we will have a delicious lunch as we cruise towards the Broughton Archipelago keeping our eyes out for wildlife. When we reach our destination, we will review kayak orientation and safety procedures before setting off for an afternoon paddle. 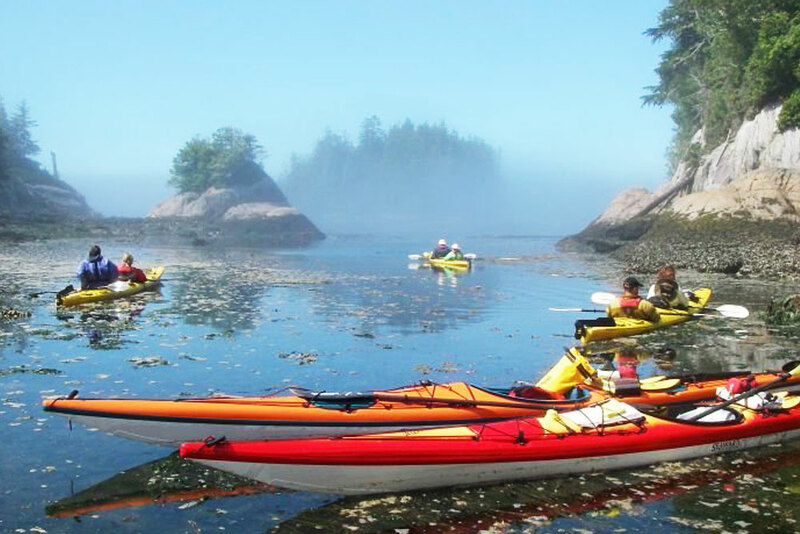 Each morning, after a hearty breakfast, we will launch our brightly coloured kayak flotilla and begin our day of exploring the beauty of the Broughton Archipelago. Every day will bring a new array of stunning sights and surprises. 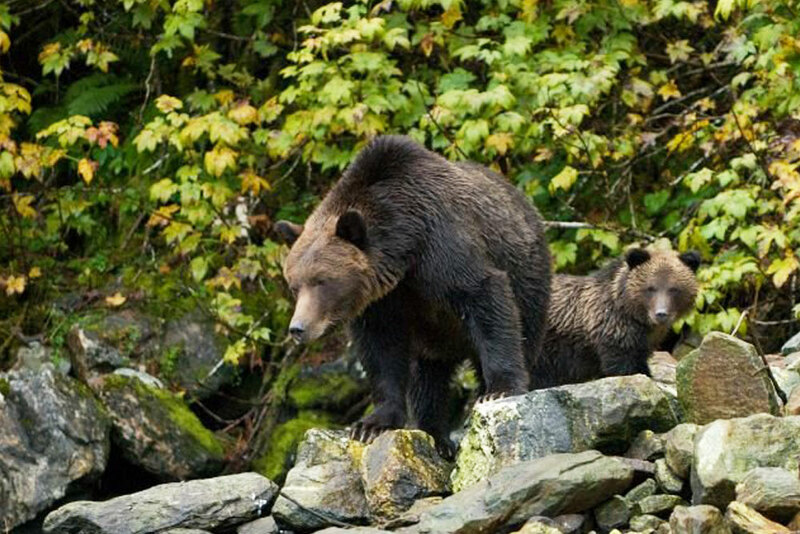 Wildlife that we are likely to see include orca, pacific white-sided dolphins, Dall’s porpoises, humpback whales, harbour seals, sea lions, black bears foraging on the beach and the majestic bald eagle perched in a tree. Lunches will be savoured on one of the many beaches throughout the archipelago, each with a spectacular view and often on an ancient First Nations village site. Afternoons will be spent paddling, snoozing on a sunny beach or relaxing aboard the cozy Columbia III. 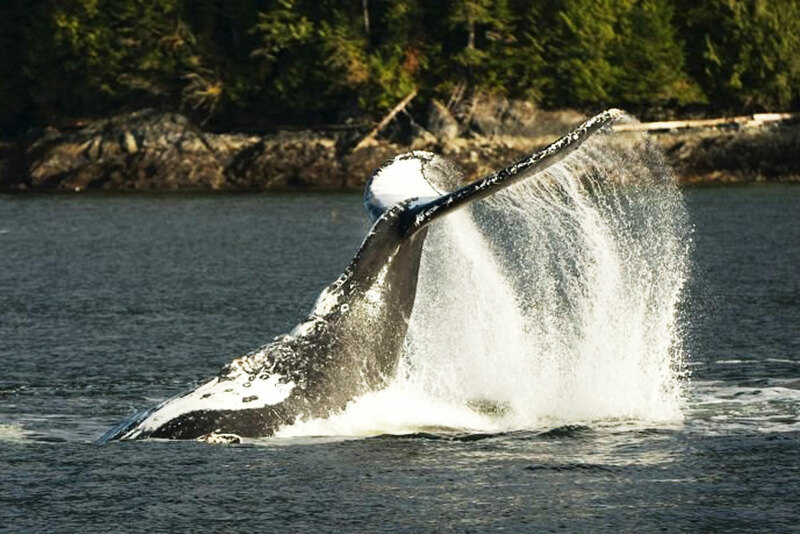 Walking in the rainforest, visiting a salmon river estuary, whale watching from the Columbia III or visiting a whale research station are all options on this tour. This is our last morning to enjoy the peaceful environment of the Broughton Archipelago. We will choose between a last paddle, or if the orca are in the area, we may spend some time whale watching from the Columbia III as we make our way back to Port McNeill. We will serve a last lunch along the way. Our approximate return time is between 1pm and 3pm, but please note that this cannot always be guaranteed as the weather and wildlife will play a role in determining when we get back. Below is a list of commonly asked questions If you have any further questions or concerns please don't hesitate to call us. "It was great to be back on the Columbia III. This trip was beyond words. I hope to see you all very soon!!!" "It was a trip of a lifetime. I will always remember it." "Thank you for a rich, rich adventure! 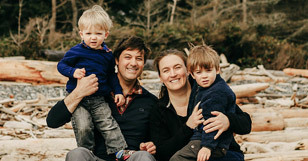 A splendid vessel, magnificent scenery, wildlife, paddling, food, and a warm, wonderful family." 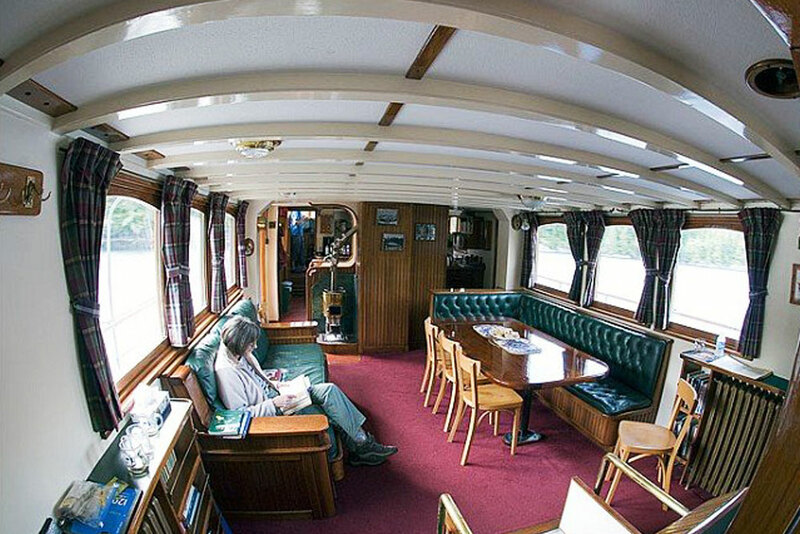 "We have never seen a boat so well cared for and restored. A true pleasure. We have never been guided so competently and patiently through verdant virginal terrain. We have never parked next to a fog bank at the seeming edge of the universe and had the glassy sea burst forth with the cacophony of porpoise pods on the hunt for breakfast! 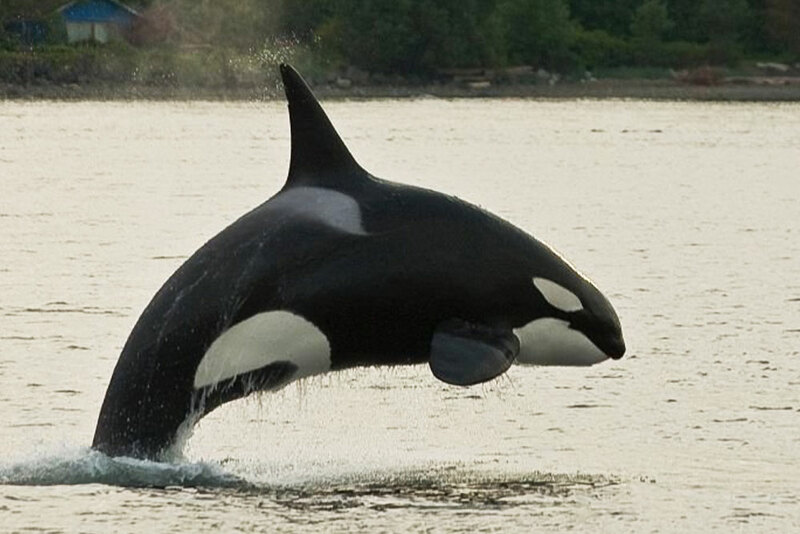 We have only been honoured once before by the majesty of the Orca and the Humpbacks. We will treasure all the seals, sea-lions, eagles, birdlife and they will renew our resolve for the caring for the planet. We have never had such nourishing lunches, dinners ad breakfasts, Surely we have never had a scone fashioned by Farlyn burst forth with flavour. Lastly, a true pleasure to be with you as a family being nourished, educated, pampered in such a companionable way. For all of this and much more we are grateful and in awe with affection and respect." "Unique and amazing experience. Thank you for sharing the Columbia III with us. The kayaking, waterways and natural life was beyond expectations." "A memorable week for sure on the venerable Columbia III with it's genial captain and crew and all the delicious meals either on board or picnic style on the beaches. Great to share with such a congenial group of fellow guests the daily outings in the kayaks with our ever patient guides, as we paddle the serene waters and absorbed all the delights of this very special part of beautiful BC. Thank you again for this wonderful experience." "What an amazing combination of 5 star paddling, food and new friends. I never thought biology/ecology could be such great fun. We'll look forward to doing it again." "A marvelous experience cruising and kayaking the secluding waters of this beautiful part of our country. A capable and professional crew and your friendliness and humor made us feel part of the family." "Long anticipated, very much enjoyed, and to be savored for a long time." "How can I possibly describe this trip to others? Impossible. They will have to come and see for themselves." "Many, many thanks for a fabulous week. Great weather, lovely paddling, exciting wildlife, etc, but especially for being so warm and welcoming, patient, and fun. We couldn't have had a better week and we will treasure the memories forever." "You guys are fantastic! Each of you has been so generous and done so much to make this the trip of a lifetime." "I came here with high expectations and you did not let me down. Everything including orcas, bears, humpbacks, weather, food, accommodations, guides, paddling etc. was perfect. When the fog lifted, the sun came up, and the orcas appeared on the last day, I came to believe that you had it all beautifully staged." "Many, many thanks for yet another extraordinary ten days in Paradise. As a 'three-peater'."